The California Bungalow is a charming & cheerful one bedroom bungalow within walking distance to Downtown Santa Barbara's famous "State Street" where you will find tons of shops, restaurants, theaters and entertainment. If you enjoy walking, you'll love taking walks around this neighborhood and marvel at the giant trees that line the street. If you're not from this area you'll be impressed by the scenery. It fills like something out of a TV show. California Bungalow is completely remodeled and updated with great character and amenities throughout. The soft and warm colors promote a feeling of rest and relaxation! You will love the spacious family room with sectional seating, 50-Inch flat screen, 3D glasses, Blu-Ray Player, and Cable TV. 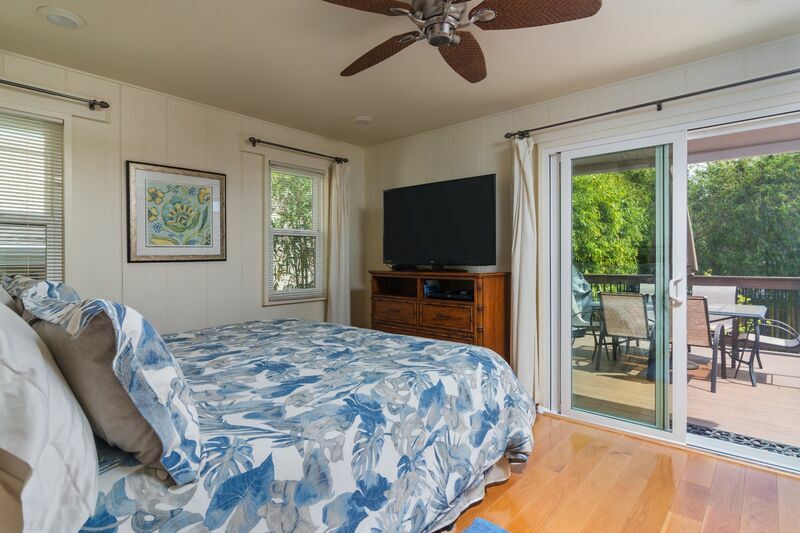 The room has a ceiling fan, and dual pane windows, screens on all the windows and screen on the front and back door so you can enjoy the fresh Santa Barbara breeze. On the rare cool nights the home has a gas pot belly stove in the corner to make things cozy. The fully stocked spacious kitchen has modern appliances, gas stainless steel stove, convection oven, solid granite counter-tops, dishwasher, and a sub zero fridge. The dining table seats four. The master bedroom features a California king bed, 50 inch flat screen TV, ceiling fan, large dresser and bed side tables with lamps. The walk in closet also houses the stacked modern low flow washer and dryer. The ensuite bathroom has a tub/shower combination and a cabinet to hold your personal items. There are screens on all windows and a sliding glass door to the fantastic rear deck. The private deck comes with a gas grill, dining table with umbrella. Down the short flight of stairs you are in the zen garden with flagstone patio, manicured and landscaped, surrounded by bamboo, you'll feel completely private. Im the peaceful zen garden you'll find 2 chaise lounges and a table with umbrella. Here is the perfect area for quiet evenings or star gazing. For those rare heat spells we have a portable AC Unit that can be set up in the bedroom. California Bungalow is the perfect retreat to enjoy all that Santa Barbara has to offer (especially movie nights at the Courthouse during summer months)!! Call us TODAY to reserve your dates. Fantastic Backyard and Deck with Gas Grill. We enjoyed very much the garden!! A very special thank you to the owner, you were very generous with us and we loved talking with you. Take care and thank you Signature Vacation Rentals. Dear SBER, This bungalow is even better in person that it appears to be online. the location is ideal. The bungalow is private and quiet. Kevin was very helpful at check in and even in the evenings. This is a place we will recommend to friends and one we hope to have the opportunity to return to. Thank you! We really enjoyed our stay in the Bungalow!! and we want to say thanks to Santa Barbara Exclusive Rentals for the help and the easy process during our stay. We just loved the house and enjoyed the time we spent here! Thanks for all! My husband and I are locals and stayed at this gorgeous rental for the month of July and August, 2013. Great features throughout, very cozy, super back yard area which we used lots for grilling and just plain relaxing. We walked and biked everywhere so location is ideal. The TV's are state of the art, fabulous cooking kitchen and plenty of space for just the two of us. I would highly recommend this property. It worked out just fine sharing the driveway with the front house and we rarely saw the guests when it was occupied. Nice, Nice set up at a great price! Love this place & Debbie! Spencer and Kevin were outstanding in their quick response to any questions we had. The owner, Deb, was very helpful, too. She is a delightful person to have as a "neighbor".